You may not think about it often, but the truth is that modern-day plumbing systems are incredible. You do not have to go outside to use the bathroom, you do not have to haul in water for your baths – you have water available to you at all times of the day or night and generally as much of it as you want. Of course, with these incredible innovations come problems too. Namely, with so many working parts, it is no surprise that plumbing problems do arise. When it’s an obvious, visible issue you can call your local plumber right away to get help – but what happens when you have a hidden clog or leak? If caught early enough, the fix may be as simple as drain cleaning and minor repairs. On the other hand, if it goes undetected it could cause serious damage to your home. 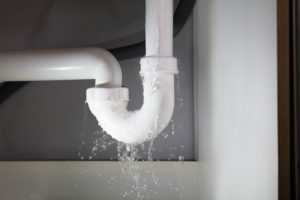 This is why we are providing five symptoms to keep an eye out for that could indicate you have a hidden plumbing leak. If you have noticed these, or you have other questions or concerns about your plumbing system, contact 1st Choice Plumbing Heating & Air at 866-437-0205 now to set up an appointment. One of the very first signs of a hidden leak is a water stain. You may find them on your ceilings or walls, but wherever they are located they are almost always a sign that you have water leaking somewhere in your home. In many cases, water may not show up as a stain but it could cause the paint on your walls to peel or chip. If you notice just one spot of a wall that is experiencing this, check to see if there are matching water stains. If you walk into your bedroom and there is a damp spot on your carpet with no ready explanation, it could be the result of a plumbing leak under your floor. When leaks run for a long period of time, they can cause the subfloor of a home to feel sunken. If left for too long, the water can rot the joists that hold up your floors. This is a very expensive repair if it gets too bad so we highly recommend calling a plumber right away. If you turn on an appliance or flip up a switch a large spark occurs, you should immediate unplug that appliance, or, if it’s a switch, turn it off at the circuit box. This may be an indication that water has gotten into your electrical system. This is an immediate danger and should be addressed immediately. If you notice any of these issues, or you simply want a checkup to assess the state of your pipes, contact 1st Choice Plumbing Heating & Air at 866-437-0205.